The nervousness about talking of government projects seems to echo right up to Rae Bareli, the Lok Sabha constituency of Rahul's mother, Sonia Gandhi. Indian Railways officials appear uncomfortable when I request access to the Rae Bareli unit. One of the officials tells me over the phone that had it been any other factory, the required permissions would have been easy to get. "But this is a politically sensitive area and I don't think the Railways will be comfortable commenting on it," he says. The project was touted by the local media as a "dream" when it was announced in 2007, though construction began only in 2010. It began its first phase of production in 2011 and churned out 18 rail coaches in 2011-12 and 80 in 2012-13, according to the official website of the factory. While the Railways did not respond to requests for information, locals who have tracked the project's progress believe that production has actually been curtailed in the last two years. "They may say whatever they like to, but once the initial excitement waned, production slowed down too," says a chartered accountant who does not wish to be named. Yogesh Kumar Gupta, chairman of the Rae Bareli unit of the Indian Industry Association, also says that the rail coach factory is not working at full potential. "Vendors, who invested crores of rupees in technology and logistics, have no purchase orders from the factory. This discourages future investors from participating in such projects because there's no return on investment." Unlike other factories in the area, entry into the Indian Telephone Industries factory is not restricted. Once inside, signs of decay in the sprawling complex become immediately apparent. Lawns lie untended, with knee-length grass blades turning brown for lack of water. While the exterior still has some semblance of paint, the walls inside have large patches where the entire plaster has fallen off. Corridors are unlit and ventilation is inadequate. Men sit at tables, mostly with no files to attend to or computer screens to gaze at. "With consistent neglect from governments, we have become a loss-making company," says an official. (The factory made a loss of Rs 344 crore in 2013-14). More officials gather around his desk to share their woes. "The factory has a staff of 2,200 and we have not been paid for the last five months. The government talks about relief packages but no relief has reached us yet," he rues. As is the case for Rahul in Amethi, his mother's visibility seems minimal in her constituency. The town is busy celebrating bada mangal, and the only signs of it being Sonia Gandhi's bastion remains in stray, occasional posters and a gate named after Feroze Gandhi, her father-in-law. While the highway to Rae Bareli is spotless, the roads connecting Rae Bareli and Amethi lie in utter neglect. "With different parties ruling at the Centre and state and Soniaji being from a completely different party, we are almost living in no man's land," a shopkeeper comments. Being the prime minister's Lok Sabha constituency, Varanasi is eager to receive its share in the development pie. Some caution against the sky-high expectations. "So far, I have not seen any change. I think Modiji needs to remember that we, his people, voted for him and the same people can turn against him if things don't change," says Baba Bhairon, a priest at Dasaswamedh Ghat. One of the most popular ghats in Varanasi, especially because of its proximity to the Kashi Vishwanath Temple, it sees the greatest footfall among the 84 ghats in the city. "We can only tell people to use dustbins and not litter Gangaji, but they don't listen to us. What we need is a task force that can implement these rules," he says. His disappointment may have been less distinct a month ago, but as Modi completes a year in office, the impatience seems to be getting stronger. Two young men are sweeping the steps of the ghat and collecting garbage in a pile nearby. One of them explains that they are employed by the civic body and cleaning happens almost at all hours of the day. A van, he says, collects the garbage and takes it to disposal lots in the city. The other, Ravi, wants to chip in but is hampered by the paan he is chewing. He rushes towards a wall and spits out a mouthful. "Modiji is good for Varanasi, but he needs to ensure that we get our salaries on time," he says. Behind him, guards chatter about the recent earthquake inside an enclosure for the Varanasi Jal Police. "Look at the ghats. They were never this clean. We ensure that no one litters either the ground or the river," says one of them, with his head held high. On a boat tour of the popular ghats, Santosh Manjhi, the boatman, points out Assi Ghat at the far end of the river. "The change there is almost miraculous. 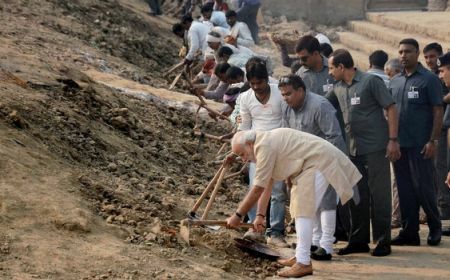 No one used to even visit Assi Ghat before Modiji came and cleaned the ghat himself," he beams. As we cross Harishchandra Ghat, one where Hindus perform the last rites of the dead, Manjhi asks photojournalist Sanjay Sharma and me to sprinkle some water over our heads as a mark of respect. After he dips his hand into the water, the unmistakeable stench and texture of sewage makes Sharma shudder. Manjhi laughs: "Gangaji sabse shuddh hain, Sir (Ganga is the purest, Sir)." At Assi Ghat, Poonam sits on the steps, making flower wreaths for pilgrims. Pointing at a step nearby, she says, "He (Modi) was right here and I saw him sweeping the ghats," she smiles. "Every monsoon, the place where we are sitting right now would be covered in mud. He has changed that." Other ghats, too, seem to be benefiting from this plan of action, but work has only begun. Workers can be seen digging out the mud and rubble from the banks, loading them on boats and rowing away to the river bank on the opposite side. According to Poonam, this is where all the unwanted soil is deposited to keep the steps clean. On the way out from Assi Ghat to the main street, stray cattle walk aimlessly on the narrow streets. The same streets are also speckled with cattle faeces, right up to the open garbage lots. The roads, though, have been rid of potholes. With the tourist season waning in Varanasi, many roads are being revamped and sewage pipes being laid. "But who knows whether Modiji is doing it or the Uttar Pradesh government is handling this," says a juice seller. Varanasi takes on a completely different character on the street that leads up to the "mini PMO" in Ravindrapuri. The Bharatiya Janata Party office is located on a street that is lined with houses sporting saffron flags on their roofs. Inside, Shiv Saran Pathak sits behind a large desk, addressing the grievances of local residents. With sandalwood paste on his forehead, Pathak patiently explains the development plan for the city. "Funds have been released from the Rs 5 crore allocated under the MPLADS fund and tenders have been given out," he says. But has Modi been able to effect change in his constituency in the last one year? "With his gestures, especially like the one at Assi Ghat, he inspires people to follow in his footsteps. That in itself is a major step." Whether or not his constituents are inspired is another matter.